Kalyan Habitat is one of the popular residential developments in Pragathi Nagar. It is among the ongoing projects of Kalyan Constructions. It has lavish yet thoughtfully designed flats with all the basic needs and amenities. Kalyan Habitat is one of the popular residential developments of Kalyan Constructions in Hyderabad. This project offers spacious and thoughtfully constructed residential apartments.This project has been designed to facilitate perfect living conditions with optimum light, ventilation and privacy, coupled with fresh and green surroundings, each apartment brings the joy of unhindered living. What is available flat size in Kalyan Habitat? Flat sizes in the project range from 1120.0 sqft to 1480.0 sqft. How much is area of 2bhk in Kalyan Habitat? 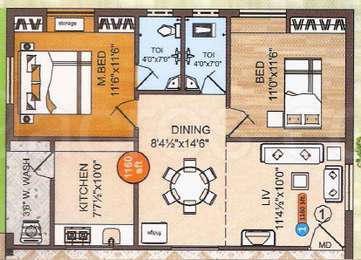 Two-room units (2BHK) in the project are available in an area of 1120.0 sqft to 1160.0 sqft. 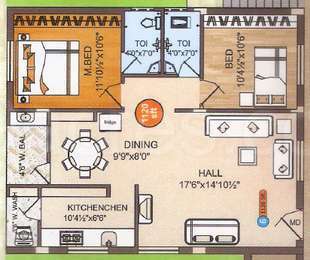 What is the area of 3 bhk in Kalyan Habitat? Three-room units (3BHK) in the project are available in an area of 1480.0 sqft. Does Kalyan Habitat have cricket pitch? The project doesn't offer a cricket pitch. Does Kalyan Habitat have skating rink? There is no skating rink in the project.